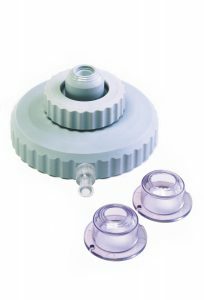 The CORONET™ Artificial Anterior Chamber has been designed to be used with any of the CORONET standard hand held trephines and is unique in concept in that one chamber fits all sizes of donor graft - ONE SIZE FITS ALL. The Artificial Anterior Chamber allows the donor cornea material to be supported on a chamber of balanced salt solution, the pressure of which can be varied to recreate the required intraocular pressure. This permits the surgeon to cut the donor button from the epithelial surface, which directly mirrors the cut on the recipient cornea and so the donor button will have a similar wound architecture to that of the recipient. Cutting the donor button from the epithelial surface also reduces potential damage to delicate endothelial tissues and facilitates better approximation with the recipient cornea, which in turn reduces the likelihood of post-operative scarring and astigmatism.